Giggle Greetings from Stampin' Up! I thought I would share with you a quick card that I made using Stampin' Up products. The stamp I used is from the Giggle Greetings stamp set. All the paper used is from Stampin' Up except for the white. I also used StazOn Jet Black ink for this because I used my ProMarkers to color in the cat. I then measured to fit, but tore the Crushed Curry and then crumbled the Calypso Coral. I then stamped the cat on white paper from Walmart, it's from Georgia Pacific. The colors I used for coloring in the cat was Sunflower, Pumpkin and Dusky Rose for the tongue. You could even throw on some googlie eyes instead of leaving it the way it is, that would be cute too. Hope you enjoyed my card today. Come back and visit soon. I'd love for you to leave me a comment or if you'd like to place a Stampin' Up order, I'd be more than happy to help you with that too. Have a great day and see you back here soon. 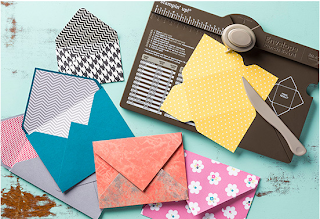 Hello Everyone, The New Envelope Punch Board code # 133774 is available now for $19.95. It's definitely a must have for your craft room.